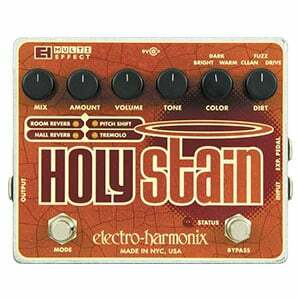 Just as one would expect, Holy Stain features everything that defines Electro-Harmonix pedals in general. We have their indestructible enclosure, an awesome sounding fuzz and distortion effect, and a pretty authentic reverb section. That is all this pedal is about. These two effects represent the most used combination even at this point in time. With that said, it is no wonder that Holy Stain became so popular almost overnight. With its clean layout and very generously spaced out foot switches, you can rest assured that using the Holy Stain won’t take any special getting used to period. In their usual fashion, Holy Stain’s controls are divided between its two effects. On the left side we have a rather elaborate reverb cluster which allows you to select between two of the most popular reverb types. However, there’s a small surprise on that part of the pedal. Aside from the two reverbs, you can also select a pitch shifter and tremolo as a mode. While the accent is heavily on the reverb and distortion part of the pedal, these two additional effects are authentic enough to be noticed quite quickly. In general, the controls are very intuitive and easy to get used to. The tone you get from the Holy Stain can be described as both semi vintage and semi modern. When you put on the fuzz, you will feel that old school flavor that once defined rock and roll. As you start increasing the drive levels, fuzz fades away and pretty convincing distortion kicks in. While not overly aggressive, it does appear to be a bit too chaotic for an overdrive. Modulation and reverb effects are on point, though. With enough modes to choose from, the pedal won’t run out of its stockpiles of versatility any time soon. to place it right on that sweet spot where everyone can get it without shattering their finances. 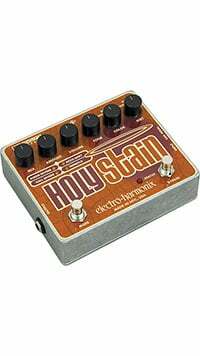 Whether you are a professional looking to spice up your gig setup or just an enthusiast in search of a great all-in-one solution, Holy Stain is one of the rare multi-effects pedals that can conform to just about anything. 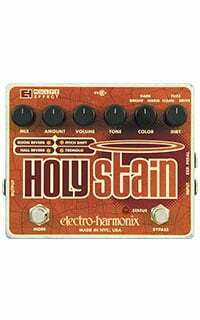 For more info about the Electro-Harmonix Holy Stain, click here.